A Sri Lankan tea factory's ironic take on the Los Angeles landmark. 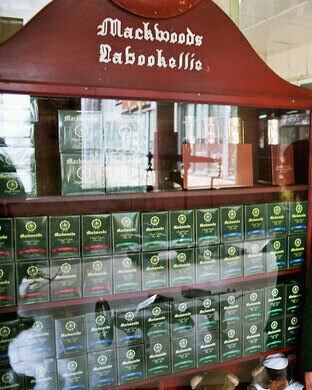 If you want to see how tea is grown, picked, and processed, Sri Lanka is the place to go. Many tea plantations in the country offer guided visits, which include walks through the tea fields, tours of the factories, and in many cases, complimentary tea tastings. 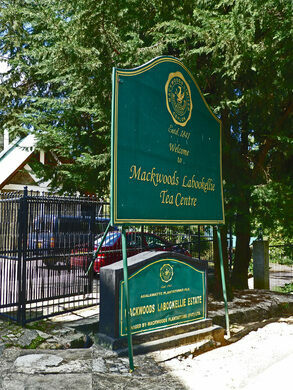 But the Mackwoods Labookellie Tea Centre tis probably the most famous of the plantations—not because of its tea museum, but because of its ironic take on the Hollywood sign. 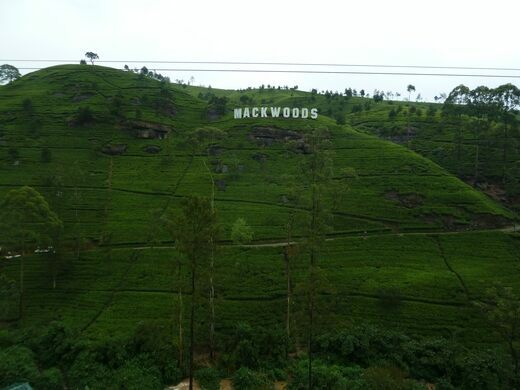 The massive white letters of the “Mackwoods” sign can be seen for miles around, and the sign is one of the most photographed features in the highland region of Sri Lanka. The Tea Centre, located in the heart of the tea plantation area between Nuwara Eliya and Kandy, is at an elevation of about 6,500 feet (2,000 meters) and, like its counterpart in Los Angeles, the sign is situated high in the hills. The Mackwoods museum tells much of the plantation's story, but a factory tour, usually available on request, is even more enlightening. The Tea Centre can get very busy during Sri Lankan holiday periods. You can take on a local bus from the bus station in the centre of Nuwara Eliya. There is a bus stop with a ‘Labookellie’ sign above it and a small bus takes you there. Buses are pretty regular and very cheap. If you tell the conductor where you want to get off the bus he will tell you when you get to the right stop. If you decide to travel by train to Nuwara Eliya from Colombo it is only about £5 for a first class (air conditioned) ticket to the nearest station Nanu Oya (about a 15 minute tuc tuc ride from the town centre) but 2nd class is a lot cheaper and the windows open so you get a better view. Even for second class you need to book in advance. Fantastic train journey particulate after you pass Kandy and much of that has a 15mph speed limit so you get plenty of time to take in the views. A Bohemian "anti-hotel" offers off-kilter stays in Sri Lanka.